Time Management and other delightfully interesting stories. My friends, today I want to write about managing time. Time management, like money management, meal plans or cleaning schedules, appear dull at first inspection (unless you are a Virgo type), but stay with me, dear reader, stay with me. Here’s the thing: I don’t do schedules. I don’t have budget spreadsheets, I don’t sit down on Sunday nights and plan the week’s meals, I don’t have a cleaning schedule and I don’t use a diary. My life would likely be better if I did do all of these things, but I was sent to this Earth with an empty space in my chart where Virgo lies, and no desire to fill it. Something strange came over me last week though. Maybe it was my ruling planet Venus moving into Virgo, or maybe it is because time has suddenly become a rather urgent commodity. Whatever it was, I was possessed with an overwhelming desire to plan my week. On a piece of paper. Why? The rot started at the beginning of the year when some friends and I bought Leonie Dawson’s Create Your Shining Year Workbook. Every month, we sit down and set goals, and halfway through the month we check in on each other. Last week was my halfway check point, and I realised that I hadn’t been doing much personal writing. I felt sad about that, and I wondered how I could find more time. When I read that, I knew straight away that my major overriding goal right now is University. My second most important goal is writing my book and also very important to me is this blog. I do not want my university studies to be like a big hungry beast and chew up all my time. I need a creative life as well, not to mention I also need to be a mother, a wife, go to work, clean the house and see my friends. I need to have a life in other words. (otherwise known as having your cake and eating it too). So on Sunday night I downloaded a weekly planner template and blocked it all out with coloured pencils: work, appointments, writing, blogging and university commitments. I knew that I had a busy week this week, with three appointments on three separate days as well as my son’s soccer and my monthly writer’s group on Saturday to squeeze in. It wasn’t ideal, but I knew I could make it work by making up those missing hours in other ways. I had 4 a.m. starts every day this week, and I had to do a couple of afternoon blocks as well, but I did it! I studied, wrote, blogged, played, attended to my health and body, as well as all of the other juicy things that make up my life. I had my cake and I ate it too, because I planned it. But what if you could find 40 minutes a day? What if you could borrow those minutes from the time that you normally spend watching your favorite TV show, or hanging out on social media? She was right. So I turned off my TV. And I STILL haven’t seen the last three seasons of The Sopranos. But since that conversation, I have written seven books. You are absolutely forbidden to leave this post without clicking on that image and feasting on these words and images. Do you hear me? Forbidden! What time can you beg, borrow and steal from your day to add to your creative life? Have you found yourself geeking out on weekly planners, budgets or spreadsheets this week? This: because I have never seen anything like it in my life before. I went into a meditative trance while I was watching it, mesmerised by her beauty, her grace and her phenomenal powers of concentration. Actually, it blew my mind. And when I heard that, I pulled off the road and wrote it down, because this is not a woman who defines herself in relation to others, no matter how important they are. She is a woman who defines herself by what she does, by her creative life. There is something very compelling about the image this conjures up in my heart. Take for instance this entrant in The Bald Archies by artist Lindsay Spears. This image flashed on the tv during the news the other night making the Bear laugh. ‘Did you see that?’ he asked. “Yes, but I didn’t get it,” I replied, making him laugh even more. “It’s Clive Palmer as Jabba the Hut and Jackie Lambie as Princess Leia!” he exclaimed. Ah. Of course :). Now that I am looking at the picture I can see it, but the Bear is so quick! About semiotics, which is the study of signs and how they work to produce meaning in what we see, hear, listen and read. A sign may be letters forming words, forming a language, or symbols of culture like a flag or universally understood icons like the disabled sign at the airport. Signs may also be symptoms such as smoke indicating fire or a runny nose indicating a cold. We are all engaged in analysing signs in our sophisticated media saturated culture – we do it intuitively. In media studies, we are being taught how to use that intuitive understanding to deepen and enrich our understanding of the various media around us. The Bear thinks it’s hilarious that I am studying this, as I am notorious for the gaps in my pop culture knowledge, making it difficult for me to interpret things that he thinks are obvious. Travel writing and designing a story. It is so exciting to be learning this process, not in bits and pieces picked up here and there, but in a structured subject that builds upon my knowledge week by week, with assignments and feedback. Nerve wracking as well, actually. I am thinking about the travel piece I am working on: about the personality of the narrator, which even though it is written in the first person, is still a construct of the author, event selection and arrangement, what characters to include, description and exposition and the overall theme of the piece. It feels different to be thinking about writing in this way, rather than just writing it and figuring it out later – but it feels good. 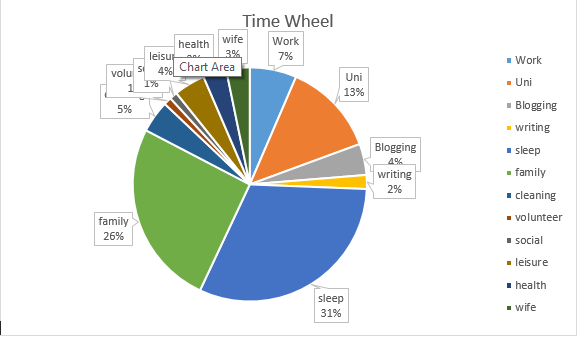 There are definitely areas that I need to devote more time to – but as all of that adds up to exactly 100% of my time, I need to borrow either from sleep or family time to fit it in. Which is okay. I do that for socialising and spending time with the Bear. As for my writing, seeing as it is one of my core priorities, you’d think I could find more time for it than that, right? Anyway, it’s a work in progress :). That’s it from me today my friends. It’s early Sunday morning, still dark, and I’ve been up for 2 hours working on this post. It’s not a sacrifice to me, because I can’t stand sleeping in – so boring! I’d much rather be here sharing my week with you 🙂 I hope you find something to interest you <3. Next Flat batteries, dropped expectations and other lessons. Virgo moon here. I LOVE my lists, excel sheets and calendars. I also LOVE color coding them and making them look pretty. I put so much time into these things…probably too much. Which is why I need to limit my planning periods…It’s actually a procrastination for me. But on my especially busy weeks – like how it seems yours was this past week (4am start?!?!?) I find it super helpful to have it all clocked out. The 4am starts are no big deal. think of it like this: I consider staying up until midnight with the same degree of disbelief that you look at my early start. I’m definitely a planner – the danger is that I sometimes like planning a little more than doing! That’s a very powerful cartoon – so sad to think of all that wasted creativity if we only took a little time to do what we want to do. Thanks for the inspiration Sara! Ardys, you understand me completely :). I use lists when necessary as well, especially if I have lots of little things to do or a big project. By necessity only though. No fancy stationery or expensive apps, just a scrap piece of paper and a pen. But, as I’ve discovered, a bit of forward (!) planning can be useful and reduce stress. Fancy! Soo glad you watched that clip omg isn’t she amazing. I used to think I was a planner but now I think I’m more of an outliner, so somewhere between a planner and a pantser. I like having a general sense of where I’m going and what I’m doing but rigid schedules and routines tend to do more harm than good for me. Likely it doesn’t make much sense to most people but I’m generally good about making my deadlines and having good results to show for my efforts so as long as there’s a method to the madness, that should be enough, right? 😉 Hope you have a wonderful week ahead! An outliner! That’s a new category. I think that’s me, actually. Pantsing it completely makes me nervous and over planning annoys and bores me. I like to have a general idea of what I am doing, especially when I’m setting up a new routine. Have a good week too, Lillian. 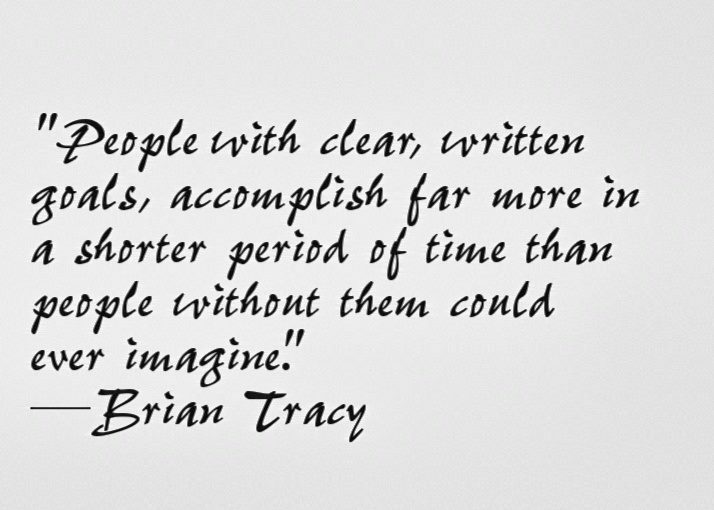 I used to make my to-do list every single day, and feel very good about getting the things done. Then something happened and my planner, accomplisher, Virgo personality went straight out the window. I think it was when I had my son. I think for a long time, I lost myself, and just lately I’ve been coming back to me (in doing healing work). I saw the balancing video on Facebook, and it is amazing! I am excited for you and your new learning. I love Liz Gilbert and will have to listen to those podcasts. The length sounds perfect for my drive to the grocery store as well (20 min). We recently returned from our summer vacation to visit family. Every time I return home after staying in houses that are uncluttered, I become depressed looking at my overstuffed house. Yet at the same time, I get renewed energy to weed out things and get rid of them (and am doing just this in fits and spurts). This summer I have decided that 16 years with kitchen countertops that needed to be either regrouted or replaced 16 years ago, are going to go. I am going to make it happen! I am realizing that if I want big (or often even small) things around here to happen, I have to make them happen. As much as I love my husband, he is not a project man, a planner, or a do-er. Yep, kids will throw any attempts to be organised out the window, for sure :). You can come back though! Sounds like it’s time. It is actually perfect time to do a major de clutter – Venus in retrograde is perfect for lavishing love on you and your things. Self care to the max! As for long overdue renos – I hear you omg. The push for these things always comes from me. We are working on the finance now for our own version of that scenario. I’ve been waiting 18 months to get the bear on side…although mind you we did have a big domestic disruption during that time. Your 16 years shows way more tolerance than I possess Susan! Good luck with those kitchen benches :). Sara, Like you, I am not by nature a planner, and in fact when asked, “What do you plan to do today,” my favorite answer is, “Whatever I feel like doing.” And I really love times when this can be true–usually a day here and there, and of course these days are on summer break from my teaching job, and of course they occur only now that my children are grown, and of course it can change in a second if one of my children or grandchildren calls and asks me to do something. But when I have great demands on my time, lists and planners and calendars are the only way to go. They alleviate the feeling of being overwhelmed and make life controllable again. However, regardless of planning, there just isn’t enough time and energy to do all the things I want to do. The biggest danger is that the first thing to go is often self-care. Sara, you must put self-care into your schedule and follow it even more faithfully than anything else. Please get enough sleep. I love reading your blog, but would be happy to read it less often if I knew that it meant that you were getting more rest, exercise, meditating, yoga, or whatever you need to take care of you. Sorry if I’m sounding like a mom, but after all, I am one. Dear Diana, I am not offended in any way by you mothering me. In fact, I quite like it :). I am always careful to structure self care time in, for even the busiest weeks. I have to, because I don’t have the stamina to do without it. Weekends are free of study and work commitments, which helps. I tell you, today I feel so tired, so I am on my way over to do some yoga and meditation, just as you suggested. Boy, do I need it. I understand just the way you use lists and charts – and to be able to pull them out for really busy times is very useful. They are just a tool though – Like you, I use them rather than them using me. Enjoy the rest of the weekend, Diana, I hope you have something delightful in store. I was never scheduled until I started a blog, and then I had to be. I don’t use a planner so much as my head. I blog on certain days and schedule my blog on certain days, And I teach on certain days/times and I work on my book on certain days. I take off weekends and evenings. Thanks for all your great thoughts here. Hi Georgia :). The fact that I never blogged according to a schedule until this past year shows you what resistance I have to schedules of any kind. I guess blogging every week at the same time showed me the benefits of working to a schedule (thank you dear blog, again!). There are some simple weeks where I have days where I can dedicate to work and days to study and hours to write and blog…but the reality is that I have bits of work here and there and kids sport and appointments and all of those kinds of things as well. I just have to get real and realise that holding everything in my head just doesn’t work for my kind of life! I was already in awe of all that you do… and now I’m more so 🙂 I haven’t taken up the challenge, yet, of a written schedule but I employ a paper diary, Outlook calendar, emails-to-self reminders and lots of post-it note reminders and lists… I love the sense of accomplishment from deleting the done emails, and binning the done post-its. I employ more and more “life-hacks” (a term getting so hackneyed, I’m almost reluctant to us it). As you know, one of my priorities is good food so you will find me before 7 am peeling potatoes and veges that can be soaked ready for dinner, carrying bags of salad veges to work that I can chop and throw together in my lunch break, doing housework weekdays before work so I have Saturday mornings free to walk to the farmers markets for the weekly shop. Using online shopping so I don’t have to drive to a supermarket to buy TP etc and lug it home. I write and read blogs before work and during my lunch break as well as walk and run errands. I read books on the train and any spare minute I have. Like you I’m up early (but not 4 am! )… assisted by the G.O.’s early starts but motivated by wanting to have these things in my life. A schedule that regulates itself. I’m happy to report I did my homework and clicked on the Zen Pencils clip. I can relate, and it’s one of the reasons I made these changes in my life. I wanted to be the person I am. And of course, it’s a work in progress for us all. You know Dale, your comment makes me so happy, because what I see when I read it is someone who knows what lights them up and prioritises that in their life. I don’t know why that is so rare, but it is. I can assure you that if I wasn’t studying, I would not be using a weekly planner :). What you do sounds fine! Good girl for doing your homework! Have a wonderful week Dale. Sara – great to have a catch up read of your sharing’s for the past few weeks. I take full circles with lists, schedules (and multi-tasking, come to think of it). So I ditch schedules for a while, and just be. And then…find myself, pen in hand pondering the possibilities of the week ahead. Through these cycles I discovered a great truth for myself that it is the ‘energy’ that sits beneath the scheduling that determines the sharpness and scarcity. I played with it a bit and found whoa! I can have a schedule and keep heart full (can have cake and eat it too!). This ah-ha moment helped me embrace all of the possibilities and less of the rigidness impact. A life lived fully – lovely! Gosh, what wonderful insights you have bought here today. What you say is my experience too – “brisk, sharp, grasping, task focused energy: good for getting tasks done – not so good for people/relationships/nurture.” Yes :). I guess my way of dealing with that is just scheduling the hours that are mine – in the early morning and when the kids are at school. I try to leave afternoons and weekends free, otherwise it’s just too much. School holidays are wonderful for that too – just dropping the schedule. In fact, I get cranky when people try to pin me down to times at all in the holidays. it’s the balance thing again isn’t it? It’s good to be popping up, albeit sporadically. I am enjoying sporadicic interface with technology, as is my theme over time. Scheduling the hours that are my own… Thanks for promoting some realizations in this area: the possibility of scheduling my own stuff in my own time moves me from absorbing all the hours through housework home n life maintenance stuff, and actually pondering (and actioning! ) some other Kate priorities that have been back burning for a while now. Thanks! Yes – I very rarely do housework in the hours that are just mine these days – I study, write, do yoga and occasionally watch something in those hours. I’m working towards housework being a more shared task (!) as the kids get older. Will download Magic Lessons for when I’m cooking in the kitchen…beats listening to the kids bicker over doing their homework. That cartoon was spot on too. What? You don’t enjoy the soundtrack of kids bickering over their homework? Tsk! ( this will be perfect, I promise). I was memorised by that wonderful video share of balancing the feather.. And watched how at the end that one feather had kept all else in balance. 🙂 AMAZING..
Here’s wishing you a beautifully time managed week. where I hope you gets lots done and you fulfil your goals and achieve that which you wish to .. Both writing and study time.. as well as time for your leisure and meditations.. Many thanks dear Sara for dropping by.. You nudged me into visiting you.. And you rewarded me plenty with this lovely post..
Dear Sue, that’s how it works in this wonderful blogging world we have – we remind each other ❤️. I’m glad you enjoyed this post – and as for the success or otherwise of this week’s time management; well you’ll have to wait for this weekend’s post. Suffice to say that the working title could be The plan is dead! Long live the Plan! :).